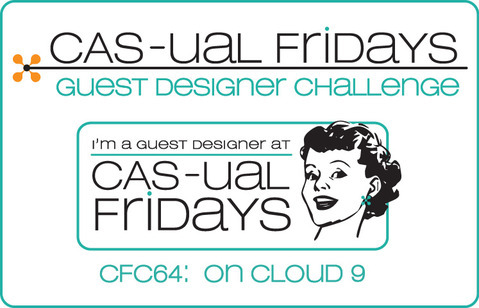 A card for this week's CAS-ual Fridays challenge On Cloud 9 where we are to create projects featuring things you would see in the sky. Awesome job on the challenge!!! Love the bling you added under the sentiment too!!! Fun - love how you chose to make only part of your card into sky - that's a cool idea! Very sweet and the tiny little gems under the sentiment are just the right touch! Very fun card Jen, cute images. Great design Jen! Love how you have centered everything around the panel! Fabulous layout! 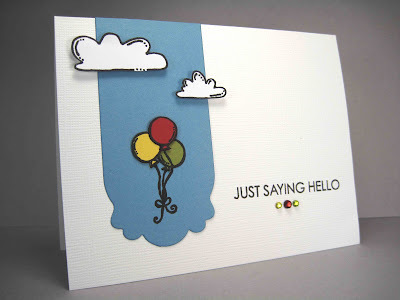 Love the trio of colors in the balloons that is repeated in the bling :) Thanks for playing this week at CAS-ual Fridays! Your card is so cute. I love those balloons.